The Honorable Bombay High Court has introduced payment of Court Fees online using e-payment system effective from 1st July 2011. 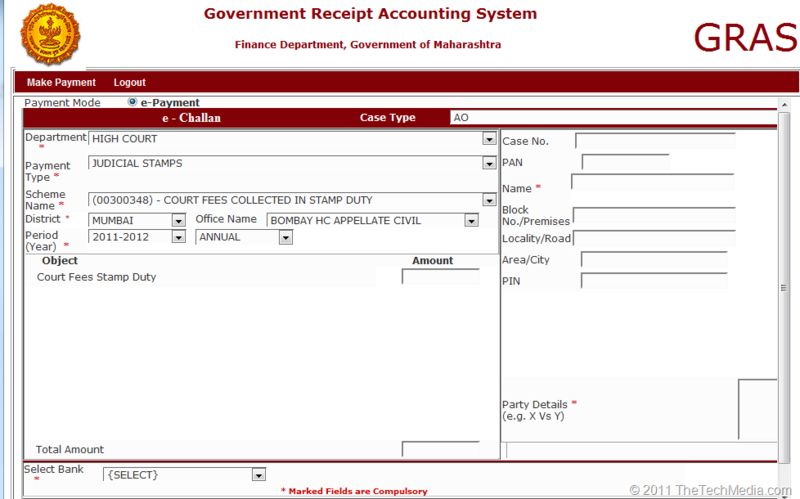 This process of paying the court fees electronically is developed in coordination with Government of Maharashtra and NIC (National Informatics Centre, India). The payment can be done through the secured GRAS (Government Receipt Accounting System) to Directorate of Accounts and Treasuries. E-payment can be made by registering on the GRAS website or without registration. The benefit of registration however is that the user need not enter the specified information at the time of every payment. After log in, user must Fill in / Select appropriate parameters and follow the required steps for making e-payment e.g. Department (High Court), Scheme Name (Court Fees collected in stamp duty),period (2011-2012), Amount ( 1000), Case Type (WPC), Name (Name of Applicant), Party details (ABC Vs XYZ), Bank (IDBI) etc. At the end of process on GRAS Website, e-Challan will be generated showing the information i. e. GRN No., Name of the Party, Case Type, Bank Details, Payment Details etc., regarding e-payment made. Lastly, User must produce e-Challan at the time of filing. For availing of the Service for making e-payment of Court Fees, user must have an Internet Banking Account in the respective Banks specified by GRAS i.e. Bank of India, Bank of Baroda, IDBI, Indian Overseas Bank and Union Bank of India. The GRAS Website at https://gras.mahakosh.gov.in has a link for downloading a User Manual for creation of a payee account on that Website. This facility is NOT applicable to Bombay High Court at Goa, as it is a separate state and has its own state legislation.